DNA is composed of two strands that wrap around each other to form a double helix. The two strands are held together by base pairing and are antiparallel. Thus if one strand is oriented in the 5′ to 3′ direction, the other strand will be 3′ to 5′. This double-helical structure of DNA was first proposed in 1954 by J. D. Watson and F. H. C. Crick. The most common form of DNA is the B-form, which is a right-handed double helix with 10.4 base pairs per turn. Less common forms of DNA include A-form, which is a right-handed double helix that has 11 base pairs per turn and has wider diameter than B-form, and Z-form, which is a narrow, irregular left-handed double helix. There is a great deal of variation in the DNA content and sequences in different organisms. 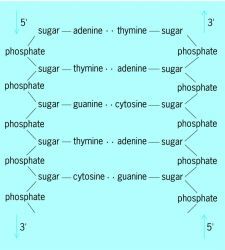 Because of base pairing, the ratios of adenine to thiamine and cytosine to guanine are always the same. However, the ratio of adenine and thymine to guanine and cytosine in different organisms ranges from 25 to 75%. There is also large variation in the amount of DNA in the genome of various organisms. 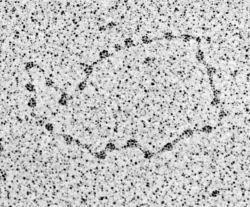 The simplest viruses have genomes of only a few thousand base pairs, while complex eukaryotic organisms have genomes of billions of base pairs. This variation partially reflects the increasing number of genes necessary to encode more complex organisms, but mainly reflects an increase in the amount of DNA that does not encode proteins (known as introns). A large percentage of the DNA in multicellular eukaryotes is in introns or is repetitive DNA (sequences that are repeated many times). In most eukaryotes the DNA sequences that encode proteins (known as exons) are not continuous but have introns interspersed within them. The initial transcript synthesized by RNA polymerase contains both exons and introns and can be many times the length of the actual coding sequence. The RNA is then processed and the introns are removed through a mechanism called RNA splicing to yield messenger RNA (mRNA), which is translated to make protein. A linear polymer made up of deoxyribonucleotide repeating units (composed of the sugar 2-deoxyribose, phosphate, and a purine or pyrimidine base) linked by the phosphate group joining the 3′ position of one sugar to the 5′ position of the next; most molecules are double-stranded and antiparallel, resulting in a right-handed helix structure kept together by hydrogen bonds between a purine on one chain and a pyrimidine on another; carrier of genetic information, which is encoded in the sequence of bases; present in chromosomes and chromosomal material of cell organelles such as mitochondria and chloroplasts, and also present in some viruses. Abbreviated DNA. Marker: A deoxyribonucleic acid (DNA) sequence whose chromosomal location has been determined and is known to have at least two forms (alleles), making it useful for identifying the locus of an associated gene. 1] Protein concentration is expressed as mg protein/mg dry weight Triglyceride concentration is expressed as mg triglycerides/mg dry weight Deoxyribonucleic acid (DNA) concentration is expressed as mg DNA/ mg dry weight * Statistically different compared to the control group (P <0. Modern life has settled on a tried-and-true plan, with the starring molecules consisting of proteins and deoxyribonucleic acid (DNA). On the edge of the coin, which was designed by sculptor John Mills, are inscribed the words which stand for DNA - deoxyribonucleic acid. GAO-02-488R March 6, 2002 Text The National Interagency Canada Lynx Survey (Protocol) was designed to determine the presence of Canada lynx through deoxyribonucleic acid (DNA) analysis of hair samples recovered from scratch pads in forests in the northern United States. DNA stands for deoxyribonucleic acid, the molecular basis of heredity. It was now known that nucleic acids were large and very complex molecules, especially since Avery had shown that deoxyribonucleic acid (DNA) and not protein was the carrier of physical characteristics (see 1944). In this research, Frost & Sullivan's expert analysts thoroughly examine numerous technologies such as clip, push button, deoxyribonucleic acid (DNA), sensory, and password tags. ISLAMABAD -- Bioengineers with the University of California at Berkeley have developed a heating and cooling system to significantly shorten the time it takes to obtain deoxyribonucleic acid (DNA) results. Zinc contributes to protein and the synthesis of deoxyribonucleic acid (DNA), immune function, and cellular proliferation.